We are excited to announce the availability of Momentum 4, the latest breakthrough in digital messaging technology. With this latest release of our flagship messaging platform, Message Systems further cements its lead as the industry-leader in digital messaging. These new capabilities in Momentum 4.0 will further enhance our customers’ email programs and drive even better customer engagement. The new features in Momentum 4 now provide real-time access to messaging and engagement data, new message generation and templating capabilities and new cloud-enabled APIs. Here’s what you can expect when you upgrade to Momentum 4. 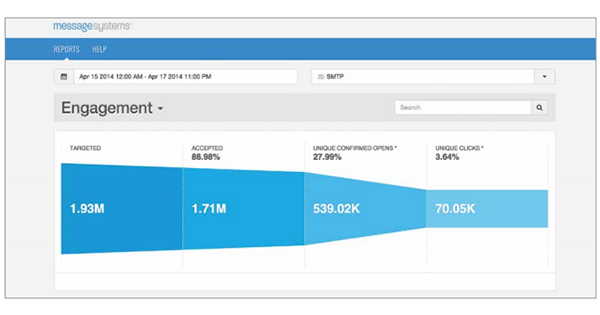 Email analytics – Momentum’s revamped architecture now allows for real-time capture and reporting of messaging events as they happen – from message transmission to customer conversion. New user interface (UI) – With the new user interface, customers will be able to easily discern the success of transmissions and campaigns and quickly identify potential delivery problems or performance issues for resolution. Message Generation: Lists, content and templates can be brought together to generate messages within the Momentum 4 platform to enable high-volume campaign-driven messages, as well as transactional messages, all in one unified messaging solution. Template Management: Powerful, but easy-to-use template management allows data to be incorporated from external business intelligence solutions and other sources, as well as supports both in-line and stored templates. Enhanced APIs: As the industry’s most extensible email software, Momentum 4 supports many new application programming interfaces, including new Injection APIs, Stored Template APIs and Aggregate Reporting APIs. Industry Leading Performance: All new enhancements fully embrace Supercharger, allowing for unparalleled server density and messaging logic complexity. The release of Momentum 4 further cements Message System’s position as the industry leader of digital messaging by turbocharging performance and helping customers to identify and quickly resolve issues in real-time. If you are interested in learning more about Momentum, we’ve got you covered. Read the full press release for more details or register for an online group training session by Message Systems University – Introduction to Momentum 4 for Senders. Message Systems solutions power a global network of the largest, most complex messaging operations, such as Internet businesses Facebook, LinkedIn and Twitter, and top email marketing companies like Yesmail and Marketo, which collectively send over 2.5 trillion messages a year — 20% of the world’s legitimate email. Find out why these top senders choose Momentum in the What Sets Momentum Apart white paper. Momentum 4 it’s a great Tool, thank you for the info.